On December 27, 2015, as a belated and spiteful Christmas present, Storm Eva caused the River Aire to burst its banks in the city of Leeds. A huge swathe of the Kirkstall area of the town was subsequently submerged, causing damage to over 2,500 homes and nearly 700 commercial properties. One of those properties affected was Hookworms’ Suburban Home Studio. The recording studio acts as the band’s HQ and as the place of work for producer/engineer and Hookworms singer/guitarist, MJ (initials are still in vogue for Hookworms – MB, JW, JN and EO complete the lineup). However, on that fateful December day, MJ stood waist-deep in water. Suburban Home was no more and Hookworms had lost almost everything. I had visited Suburban Home in 2013 for a chat with Hookworms for tQ. The band were just about to release their mighty debut album, Pearl Mystic - a record that fused psychedelia, drone and satisfying slabs of noise - and were in fine spirits. The studio was next door to an ‘exquisite cake-making company’ and the interview was conducted against a backdrop of the delicious whiff of top-notch baking. 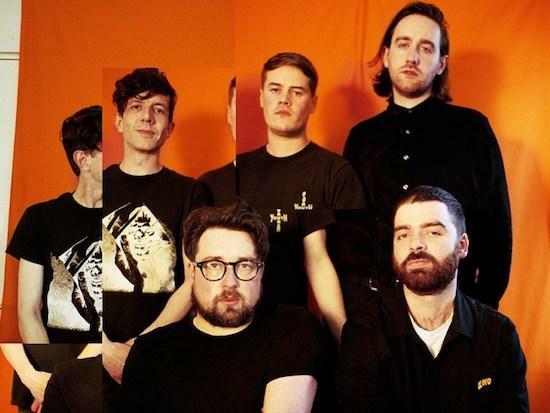 Fast forward five years and Hookworms preside over version two of Suburban Home. After months of toil and backed by a successful GoFundMe campaign, the studio was rebuilt in 2016. And it was during this time (and following 2014’s The Hum) that the astonishing new Hookworms album, - Microshift, was created. Microshift is a seismic sonic shift. The dexterous songs are dominated by synth lines, samples and juddering motorik beats. And while the sound is lighter in tone than previous work (lead single ‘Negative Space’ is wonderfully close to being a pop song), the lyrical content expertly navigates the subject matters of death, grief and mental health issues. It might sound different, but Microshift is very much a formidable Hookworms record. This album is the proof that Hookworms - and Suburban Home - have survived, endured and reinvented themselves. I never did ask about the fate of the posh cake company. I’d like to start by asking you about the flood and the impact it had on Hookworms. When did you first realise there might be a problem for the studio? MJ: I knew it was going to happen, as I had been sent a flood warning to my phone. Christopher [Duffin], who plays sax on the record, who was the only other person I knew in Leeds as it was Boxing Day. He came to help me move everything we could up into the loft within the studio. There wasn’t much more thought put into it than that. I wasn’t panicking or thinking about the consequences – I just wanted to get my stuff moved a soon as possible. However, then when it happens and you are stood waist high in water, you are not really thinking about anything else apart from getting out. It wasn’t until months later that it became apparent just how bad it was. Even now, I am still dealing with a lot of administration regarding the flood. But, I have been really lucky for the support I have had through it all and a lot of positive things have come out of it, which has been great. I remember at the time, that there was a pretty successful GoFundMe campaign to get the studio back up and running, but was there a time when you thought it wouldn’t be possible to rebuild Suburban Home? MJ: Yes. For about four months after the flood, I felt like getting the studio back wasn’t going to happen. Even when I was rebuilding it, there were times when I didn’t know if I would finish it. The GoFundMe campaign was amazing. I didn’t expect to get anything from that. I was hugely grateful. That was one of the positive aspects. I wasn’t really aware that anyone paid any attention to what I did. I got so many nice messages and emails from people, who said they enjoyed our records or records I’d produced and that they wanted us to get back on our feet. That was really nice. In some ways, we now have a better studio. The acoustics are improved, but there were a lot of financial constraints, obviously, with the rebuild. We still lost thousands of pounds. I lost a lot of personal belongings as I was moving house at the time and had stored a lot of my clothes at the studio. I lost my car as well – I saw it submerged on the news. I lost pretty much everything. I cannot buy a house now because of the flood and still have huge financial difficulties. While I appreciate that Suburban Home is MJ’s place of work, when I visited you in 2013, it also felt to me like Hookworms’ HQ. How did the flood impact the band as a whole? MB: Well, we also lost all our merchandise as well – thousands of pounds’ worth of stock. On a more practical level, we stopped songwriting. We only had a couple of shows booked, so when we did need to practice, we had to go to a bog-standard practice room, where you pay for three hours. You cart your equipment in, play, and then cart your equipment out. All we could do was practice for the next gig and we had no time to write. It made me realise how lucky we were to have the studio and having time and space to do whatever we want. Most bands have to ‘pay as you go’. Let’s talk about the new record. There is a very different sound to Microshift than on previous albums. Was this new direction a very conscious decision? MB: I don’t know if we sat down and had a conversation, but it did feel like it was naturally going in a different direction. Some of the new instruments we had acquired, lent themselves to the music going in a different direction. The last album was very much about how we sound live. We wanted to write songs in a different way. So rather than all being stood in a room facing each other, as on the previous album, we did a lot more on computers and with samples. Why do you think the Hookworms’ sound has become more electronic-based? MB: Well, I spent a lot of the last few years playing around with synthesizers, so that’s where my interest came from, but all of us have been listening to more electronic music. We’ve been listening to more techno over the last five years and that type of music has probably taken over from listening to guitar bands. Nash also does his solo project which is more electronic, and I have been playing electronic music [XAM project] with different people. EO: It’s a natural evolution. We have been in a band for almost ten years. I was 19 when we started and as you get older, your tastes in music change. My tastes have matured; I used to struggle to get past music that wasn’t fairly immediate like punk and garage rock. For me, it’s been about discovering and devoting more time to different types of music. MJ: The new album isn’t a complete departure. The genesis of each song is still based around the loop – almost all Hookworms’ songs are based around repetition. It was usually the bassline that formed that loop, but on these songs, it’s more likely to be an electronic sound or a sample that forms the loop. You can hear that quite clearly on a track like ‘Negative Space’. So, I don’t think this album stretches what we do as much as other people seem to think. Maybe that’s because we have lived with it for almost three years and it’s been a real slog to get it to this point. I can see why it might be startling at first, but they are still part-songs built up over a repetition. Microshift also sees Hookworms collaborating on songs for the first time. How did that experience influence your songwriting methods? MJ: The song we did with Christopher [‘Boxing Day’] was about just letting him do his thing as we knew we wanted a wild saxophone on the track. The song, ‘Each Time We Pass’, we did with [Alice] Merida [Richards], was much more of a collaboration. We had half of a song and I wasn’t really sure which direction it would take. I was a bit stuck on the melody and vocal lines. I sent her the song, without anything on it at all, and she sent it back with the first verse and chorus and it completely changed how I approached the song. So, that was completely collaborative and I found it incredibly rewarding. I feel quite positive about that song, because it doesn’t really feel like it’s ours. It was the same thing with the Richard Formby track [‘Opener’]. We did a whole set with him, and the song came out of that. I hope we can do more collaboration in the future as we all really enjoyed it. Lyrically, Microshift covers some pretty heavy subject matter. How did you approach writing about such difficult subjects? MJ: For the first time, I worked on the lyrics beforehand, as the songs were developing. Before that, the lyrics were often something I tossed off right at the end. This time, I spent a lot more time thinking about them and working on them. There were certain things I knew I wanted to talk about on the record. In the past, I could get a little lost in the lyrics. This time I knew I wanted to do a song about Alzheimer’s and we were all grieving for a friend who died, so I knew I wanted to do a song about that. I had just been through a break-up, so it was inevitable that I would write a trashy break-up song. As someone who has also lost a parent to Alzheimer’s, I am wondering how you even begin to write a lyric about that experience? MJ: It was all very personal experience. When I say I wanted to write a song about Alzheimer’s, it wasn’t necessarily about it as a disease as a whole, it was more about losing my father to the illness. I wrote it down and it was okay – and everything I want to say about it is in the song. You’ve said previously that all Hookworms’ records are “about mental health.” Is there anything cathartic in writing about that subject matter? MJ: The first album was about depression, which I had been struggling with. I was telling everyone that things weren’t so bad when we made the second album. Since then, I have had a really bad time over the last few years. I had depression again and I don’t have anything more nuanced to say about that. However, there were important subjects that I wanted to write about on the record. The first one was about masculinity and the other one was about anxiety in public spaces, centered round body image, which is something that links back into masculinity. Men don’t often talk about these things, but I know a lot of my friends have dealt with these issues. It was hard to write about as I didn’t want it to appear as crass sloganeering. I tried to approach the issues through more of a personal lens. I have always struggled with anxiety in public spaces and body image, and I know I am not the only one. I just thought it was an important thing to sing about. I do think it is good to get your thoughts about something clear in your head and writing them down is an easy way to do that. A lot of the bands I work with – bands like The Spook School and Martha – sing about these issues - it seems more common in the DIY/punk scenes that they inhabit, but less so in the kind of music we are making. I wanted to work out how we could marry those sorts of lyrical themes to the music we were making. Obviously, it means I will then have to sing these lyrics, but what I would say is that I have got pretty good at not thinking about it too much when I sing. Although I haven’t had to sing these new songs many times, so ask me again in six months when we have played them more often. In some ways, Microshift, sounds like Hookworms poppiest record to date. Was it a conscious decision to balance the heaviness of the lyrics? MJ: No, we wrote the songs together, before we discussed what the lyrical content might be. There was a part of me that was perhaps worried that the songs we had written were so poppy, that I should write darker lyrics to go balance them out, but it wasn’t a formal conversation we ever had. And how does the new sound impact your live shows? MB: Well, I have way too much stuff now. It takes me far too long to set up and pack down. There are quite a few songs that I don’t play bass guitar on. Quite often, Nash is drumming along to sequencers and stuff like that, so that brings a different element. Other than that, it’s not dissimilar to what it was before. JW: We played two shows recently and I had been concerned that the set wouldn’t flow with the new songs, but, in fact, the opposite was true. The feedback was that the new songs fitted in seamlessly. So, it’s the best of both worlds; it’s a different enough album but it still works live. And is that it for Hookworms – no going back to the old guitar-led sound? MJ: Yes, while we haven’t thought about what we will do next, I cannot imagine us going back to being what we were.